Chinese New Year is the longest and most important of the traditional Chinese holidays. New Year's Eve functions as a reunion for many families whose members are extended across the country; unsurprisingly, travel soars in China during this time. Perhaps this chaotic atmosphere explains why a mentally ill grandfather was able to leave his infant granddaughter, FeiFei, on the train tracks at Chongqing Station without raising alarm. No one noticed FeiFei until it was too late; a train bore down on top of the infant, severing both of her legs. Against all the odds, FeiFei survived her misguided grandfather's actions. 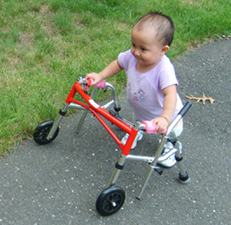 She was able to meet all developmental milestones as a toddler, learning to walk with the help of custom prosthetics and rehabilitation provided by the Shriners Orthopedic Hospital for Children in Springfield, Massachusetts. FeiFei will continue to receive new prosthetics and rehabilitation programs from the Springfield Shriners as she continues to grow and develop.